Recently I ran into an issue of agents not showing up in Pending Management after installing SP1 UR2 at a customer. I had installed the files using and elevated command prompt and the files on the Management Servers were updated to the correct version. The installer didn’t return any errors on the screen. I tried rebooting the MS servers and that didn’t help. So I tried the update again and no change. Looking through the event logs I ran across this error. Message: The EXECUTE permission was denied on the object ‘fn_ManagedTypeId_MicrosoftSystemCenterHealthServiceCommunication’, database ‘OperationsManager’, schema ‘dbo’. 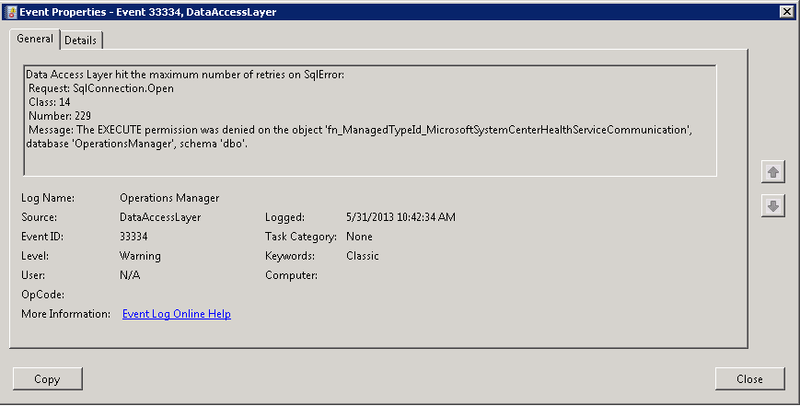 The user doing the install was an admin on the Server and the SQL server but didn’t have SA rights to the DB. When installing SP1 UR2 make sure the user has SA rights to SQL. Do I have to reinstall to get this to work then?